Occasionally if you ride on public roads you will strike an aggressive motorist. One who does not recognise your right to operate your vehicle on a public road, with the same rights and responsibilities as other vehicle operators. These people are mostly stupid, or if not stupid just plain ignorant. Some of the arguments they use to justify their actions are listed below. Cyclists do not pay registration – They use this to justify their belief that cyclists should not be on the road. The facts are that registration paid by all road users does not even go close to covering the costs (land use, social, environmental, health, construction, maintenance) associated with road use. The heaviest vehicles (trucks) are in fact the most heavily subsidised, cars less so, motor bikes and bicycles even less. Local roads are constructed and maintained by local councils and so not funded by registration payments. Apart from all this many cyclists are also motorists and so pay registration anyway. I pay full registration for my car yet I use it very little in comparison to many other car owners, I am in fact subsidising them. Cyclists slow down the traffic – This basically stems from the belief that cyclists do not belong on the road. The road rules recognise bicycles as vehicles. Cyclists are therefore part of the traffic. Part of driving, either a car or a bike in traffic, is waiting for other traffic. Be it traffic lights, buses, trucks, other cars blocking the road or (gasp!) bikes. Yes having to wait for cyclists is part and parcel of operating a motor vehicle. Cyclists often have to wait for motorised traffic, at traffic lights, behind queues of cars, at bus stops etc. 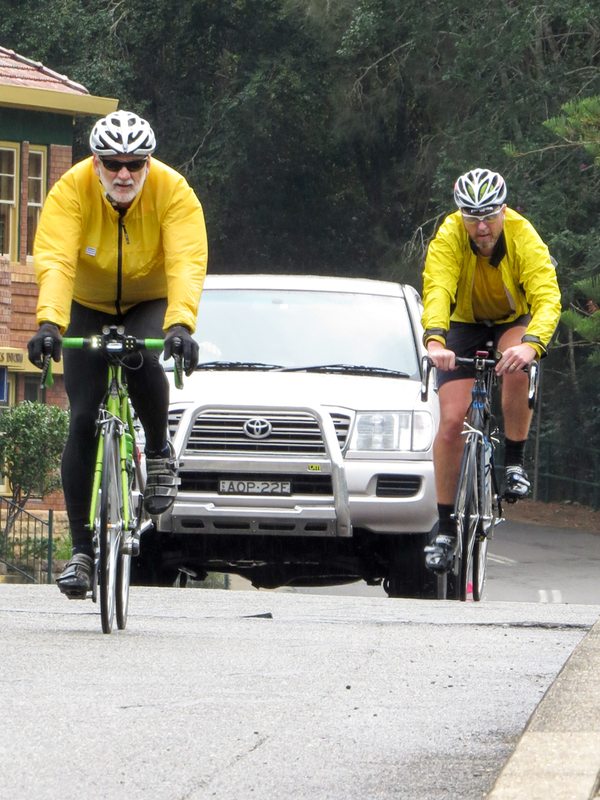 Cyclists don’t obey the road rules – These ignorant motorists believe that because some cyclists break the road rules they have the right to act aggressively and try and force all cyclists off the road. This is obviously unsound reasoning. Sure many cyclists break traffic rules, running red lights etc. But also many motorists break traffic rules (what percentage of motorists never break the speed limit?). It is up to the police to enforce the traffic rules for both groups. Just because some cyclists break the rules is no reason to behave badly towards all cyclists. They don’t understand cycling – Most people see cycling as an activity for children and see bikes as being a kids toy. Because they don’t understand cycling they become scared and aggressive when they see cyclists riding on the road. They are bullies – It has been my experience over years that you are much more likely to experience this type of behaviour when riding alone than as part of a group. They are driving a much larger vehicle than you and if you are alone they see an opportunity to try to exert their perceived power over you. Also this behaviour seems to occur more often when there is more than one occupant in the car. So now you have some understanding of why these people might behave in the way they do towards you. How do you respond to them. Over time my experience has been that it is best to ignore them and continue behaving correctly, in accordance with the road rules. Definitely to not take any action (e.g. hand gestures) to escalate the level of aggression present in the situation. If it comes down to it these people are driving a much heavier vehicle than you and they could be dangerous, also they may take out their aggression on the next cyclist they come across. Don’t sink to their level. You could use some of the reasoning listed above to argue in a logical manner with them about their behaviour, your right to use the road etc. The opportunity to use this reasoning rarely presents itself and is generally wasted on these types of people. I think the message generally does not get across. One other thing to think about is that you also often experience aggressive behaviour when driving a car. Sure you are slightly more isolated from it than on a bike but it still does occur. So try not to take such behaviour too personally when riding your bike. These ignorant people are probably the same ones behaving aggressively towards their fellow motorists. The other thing to bear in mind is that these people in the vast majority of cases are not genuinely interested in hurting you. If they wanted to do that they would almost certainly succeed as it is not too difficult to hit a cyclist when you are driving a car, if that is what you actually wanted to do. No these people are interested in harassing you for their own sport, if you ignore them you will not be giving them the satisfaction of obtaining a reaction from you. The best response is to ignore such behaviour and continue to operate your bike in a vehicular manner in accordance with the road rules. If the incident is serious, or maybe even if it is not, you should report it to the Police. If possible take the registration number of the offender and also the registration numbers or details of any witnesses to the incident.